On a recent trip to Santa Barbara, our primary mission was to visit The Boy (our middle kid) at his nearby institution of higher learning (to make sure that he is, in fact, actively engaged in higher learning). We had very little extra time to do frivolous things like wine tasting, but a Thirsty Kitten will always find a way. As luck would have it, our hotel— the quaint and hip Hotel Indigo— was situated smack dab in the midst of The Funk Zone, a formerly industrial area of Santa Barbara that has been revamped into a hub for the arts and includes many restaurants and wineries, as well. Given that Santa Barbara County is such a wonderful haven for great winemaking, the town of Santa Barbara has wisely created an Urban Wine Trail to make it easy for visitors to sample the vintages of a variety of area wineries without even leaving town. We discovered that a large number of the wineries on the Urban Trail were within a stone’s throw of our hotel. 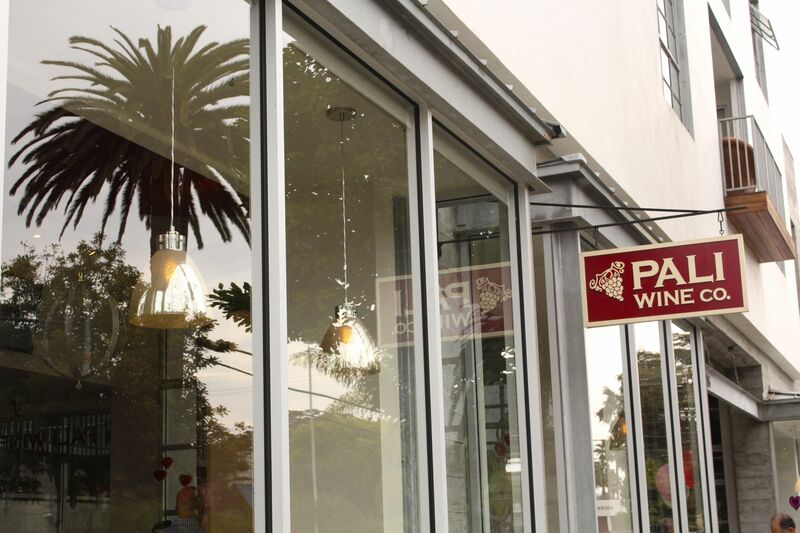 Pali Wine Company, where we especially fell in love their beautifully crafted Pinot Noirs. Winemaker Aaron Walker trained under the esteemed Brian Loring, a well regarded name in the world of California Pinot Noir, and impressed us not only with the quality of the juice he’s crafting since taking over winemaking from Loring but also with the fact that he’s down-to-earth enough to be pouring wine and bussing glasses in the tasting room, as well. AVA Santa Barbara, the tasting room for The Valley Project, where our inner wine geekiness was generously rewarded with boatloads of cool information and facts. Surrounded by maps and soil samples and served wines made from each of Santa Barbara County’s winemaking regions, this was wine learnin’ and sippin’ at its finest. We loved hearing winemaker Seth Kunin, who was at the tasting bar greeting visitors, speak of his passion for Santa Barbara’s distinct growing regions and how this passion led him to start The Valley Project to showcase Santa Barbara’s wine country. Kunin Wines. In chatting with Kunin at AVA Santa Barbara, we learned that he’s been specializing in Rhone varietals at his namesake winery since he founded it in 1998. We couldn’t help but wander down the street to investigate. 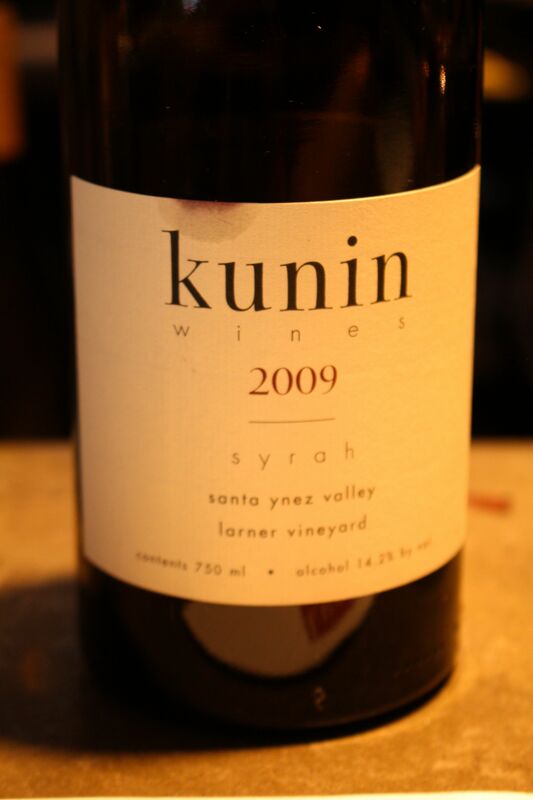 We chose the all Syrah tasting option and adored comparing vineyards and past vintages produced by Kunin. His wines—which strike a balance between robust California fruit and refined French Rhone-style elegance— have been routinely scoring high ratings from Robert Parker and Stephen Tanzer for years. So this week, we raise our glasses to the delights of Santa Barbara County wines and present you with A Thirsty Minute, a time-lapsed, speed-tasting version of our afternoon in The Funk Zone. Cheers! As it just so happens, I visited the Funk Zone a few weeks ago with my MN sister and was thinking of you guys while there. Low and behold here you are blogging about it. Very cool. We visited Marchands Wine Bar & Merchant since one of their managing partners was a somm at RN74 in SF who purchased iOTA’s 07 vintage for the restaurant years ago…great spot! So synchronous, Lynne! Love it. Would have been grand if we’d actually overlapped there at the same time. Thanks for the tip on Marchands. We’ll definitely try it on our next trip there. I love Santa Barbara! And your video is perfect! Cheers. Thank you, Patty! Cheers to you, too. Hello! Came across your blog after becoming twitter friends (don’t you love social media) and saw that you were recently in SB for a quick visit. Don’t you love The Funk Zone? If you ever need tips for awesome restaurants and off-the-beaten path spots for wine, would love to help (you can read more on my blog, too). Cheers! Hello Wander & Wine! So glad twitter connected us. We’d love your suggestions for our next Santa Barbara trip. Nothing better than inside tips from people who live in and love a place! We’ll peruse your blog and get in touch before we head out there the next time. Cheers!